The regularity of protests should not be normalized. As a state of protest becomes the norm, they lose their ability to get attention and make people's voices heard. Protest infrastructure must stand apart, and cannot become woven into the fabric of everyday life like so many of the urban systems we take for granted. Protests draw power from the places where they occur - in front of a government institution or within the heart of a community. Protest infrastructure need to be deployable to the places where people feel their voices need to be heard. Such a systems goes to the people, rather than cordoning them is designated zones. Distributing protest spatially risks diluting their impact by fragmenting collectives. Protest infrastructure must harness and augment technologies, which are so fundamental to the organization of action, to assemble collectives spread across the city. To help people amplify their presence and their voices, we propose a mobile and distributed infrastructure that stands apart from everyday life and goes to the places where people feel their voices need to be heard. 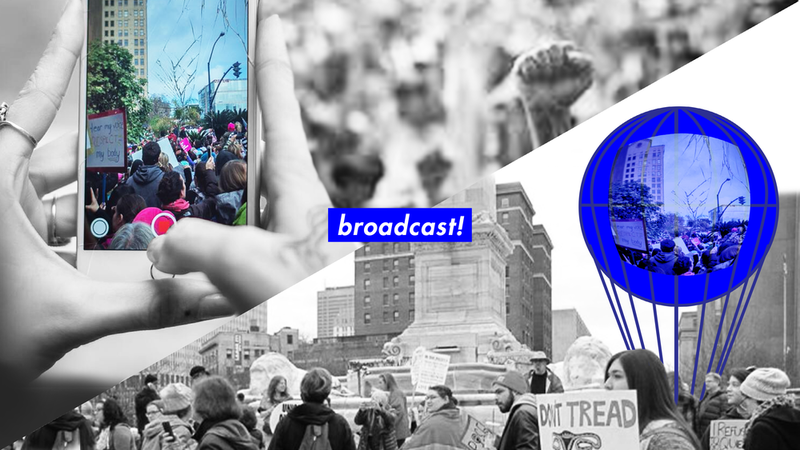 This mobile “flock” supports protest and free speech by harnessing and augmenting familiar technologies like social media that are crucial for assembling networked collectives spread across the city and mobilizing people for action. Bridging digital and physical realms, a series of hovering, interactive place markers share and disseminate moments and messages from events throughout the city.